Calcium is a critical second messenger in neurons that contributes to learning and memory, but how the coordination of action potentials of neuronal ensembles with the hippocampal local field potential (LFP) is reflected in dynamic calcium activity remains unclear. Here, we recorded hippocampal calcium activity with endoscopic imaging of the genetically encoded fluorophore GCaMP6 with concomitant LFP in freely behaving mice. Dynamic calcium activity was greater in exploratory behavior and REM sleep than in quiet wakefulness and slow wave sleep, behavioral states that differ with respect to theta and septal cholinergic activity, and modulated at sharp wave ripples (SWRs). Chemogenetic activation of septal cholinergic neurons expressing the excitatory hM3Dq DREADD increased calcium activity and reduced SWRs. Furthermore, inhibition of muscarinic acetylcholine receptors (mAChRs) reduced calcium activity while increasing SWRs. These results demonstrate that hippocampal dynamic calcium activity depends on behavioral and theta state as well as endogenous mAChR activation. Prominent oscillations in the hippocampal local field potential (LFP) entrain neuronal activity across behavioral states. The theta rhythm, a 5–12 Hz oscillation dependent on cholinergic and GABAergic inputs from the medial septum, predominates during exploratory behavior and characterizes REM sleep (Winson, 1978; Rawlins et al., 1979; Lawson and Bland, 1993; Zhang et al., 2010; Buzsáki, 2005). In contrast, during quiet wakefulness and slow wave sleep, states of low cholinergic tone (Kametani and Kawamura, 1990; Marrosu et al., 1995; Buzsáki et al., 1983; Zylla et al., 2013), the LFP transitions to irregular activity punctuated by sharp wave-ripples (SWRs), brief, high frequency oscillations in the local field potential associated with bursts of neuronal activity (Buzsáki et al., 1983; Buzsáki, 2015). Recently, large scale imaging of neuronal somatic calcium (Ca2+) activity in behaving animals has been employed as a proxy for electrical recording of action potentials (Dombeck et al., 2007; Dombeck et al., 2010; Ziv et al., 2013; Sheffield and Dombeck, 2015; Hamel et al., 2015). However, the impact of these behavioral and electrophysiologic states on dynamic Ca2+ activity is unknown. The tight relation between single action potentials and Ca2+ events in reduced preparations (Ohkura et al., 2012) supports the expectation that Ca2+ events, like action potentials, would coordinate with theta and SWRs. However, neuronal Ca2+ levels can be regulated by modification of ionic conductances and by release of Ca2+ from intracellular stores, the latter a process dependent on InsP3 and ryanodine receptor signaling cascades (Stutzmann and Mattson, 2011). As both of these mechanisms are subject to modulation, these observations raise the possibility that the coordination of hippocampal Ca2+ activity with LFP oscillations may depend on neuromodulators such as acetylcholine (Lewis and Shute, 1967; Teles-Grilo Ruivo and Mellor, 2013). Medial septal cholinergic neurons densely innervate the hippocampus (Mizumori et al., 1990) where they play a key role in hippocampal function (Teles-Grilo Ruivo and Mellor, 2013). Their ablation significantly impairs hippocampal dependent learning and memory, and this effect is recapitulated with muscarinic acetylcholine receptor (mAChR) blockade (Winson, 1978; Mizumori et al., 1990; Hasselmo, 2006). ACh has many actions in the hippocampus. It contributes to hippocampal theta, reduces SWR activity (Vandecasteele et al., 2014; Norimoto et al., 2012), and selectively enhances entorhinal cortex afferents relative to those from CA3 (Hasselmo, 2006). At the single neuron level, ACh depolarizes pyramidal cells and reduces both spike frequency adaptation and the slow afterhyperpolarization (Teles-Grilo Ruivo and Mellor, 2013; Hasselmo, 2006; Giocomo and Hasselmo, 2005; Brown and Adams, 1980; Fernández de Sevilla and Buño, 2003; Cole and Nicoll, 1983). In addition, via a muscarinic mechanism, ACh has been shown to increase the rate of large somatic Ca2+ transients via release from InsP3-sensitive Ca2+ stores (Power and Sah, 2002; Cho et al., 2008) and to uncouple Ca2+ from the Ca2+ dependent K+ conductance (Müller and Connor, 1991). These observations suggest that physiologic changes in cholinergic activity, across the sleep-wake cycle and across LFP states, might have profound effects on dynamic Ca2+ activity. 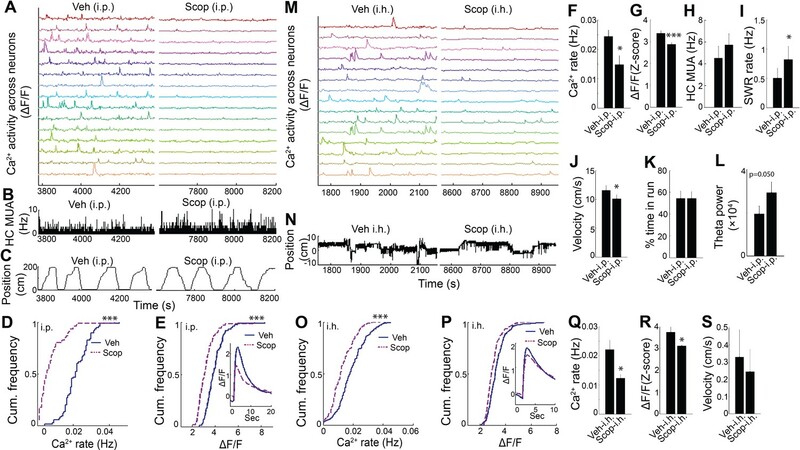 To determine the relation between hippocampal physiologic state and Ca2+ activity across behavioral states and the sleep-wake cycle, here we imaged dynamic Ca2+ activity in neurons of the CA1 pyramidal cell layer and acquired concomitant LFP recordings as mice performed a spatial task and subsequently slept. To evaluate a causal role for medial septal cholinergic neurons, we blocked mAChRs pharmacologically and drove ACh release via selective expression and activation of the excitatory DREADD hM3Dq (Roth, 2016) in medial septal cholinergic neurons. We found that neuronal Ca2+ activity was markedly more robust during theta- and ACh-associated exploratory behavior and REM sleep compared to quiet wakefulness and slow wave sleep. In addition, somatic Ca2+ activity was strongly modulated around SWR events. Further, hM3Dq-mediated activation of medial septal ACh neurons increased dynamic Ca2+ activity while reducing SWRs, and somatic Ca2+ activity - in both wildtype animals and in chemogenetically activated animals expressing hM3Dq in septal cholinergic neurons - was markedly suppressed with the muscarinic AChR (mAChR) antagonist scopolamine. Together, these results demonstrate that hippocampal dynamic calcium activity depends on behavioral and LFP state as well as on endogenous mAChR activation. 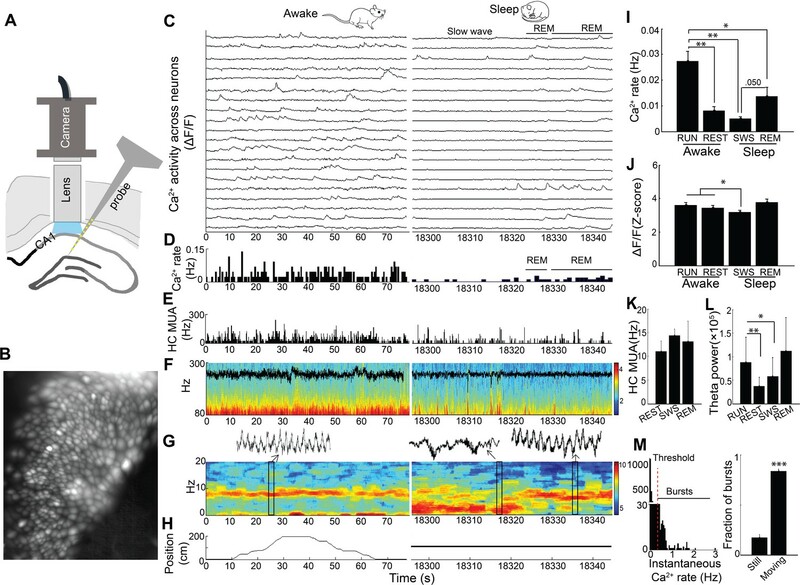 We imaged somatic Ca2+ activity from CA1 neurons and simultaneously recorded LFP as mice traversed a linear track and subsequently rested quietly and slept in a post-behavioral recording session (n = 5 mice, cells/session: 88, 119, 130, 134, 171; Figure 1A–H; Figure 1—figure supplement 1). There was a significant main effect of behavioral state on Ca2+ event rates (repeated measures ANOVA: F (3, 12)=17.97, p<0.001; Figure 1I). Ca2+ event rates were markedly higher in run behavior (>3 cm/sec) than in all other states and were lowest in SWS (post-hoc comparisons with run: quiet wakefulness, p=0.007; slow wave sleep, p=0.003; REM, p=0.011; Figure 1I and Video 1). Interestingly, with the advent of REM sleep, Ca2+ activity increased from slow wave sleep to levels approaching those observed during wakefulness (REM vs. slow wave sleep, p=0.050; Figure 1I and Video 1). There was also a significant main effect of behavioral state on Ca2+ event amplitudes (repeated measures ANOVA: F (3, 12)=4.488, p=0.025; Figure 1J). In post-hoc comparisons, Ca2+ amplitudes were significantly smaller in slow wave sleep than in run behavior (p=0.042) or quiet wakefulness (p=0.032). Multiunit activity was not markedly modulated across behavioral states in these recordings (repeated measures ANOVA: F (2, 6)=0.591, p=0.544; Figure 1K), although a microscope-associated electrical noise artifact prevented contrasts of run behavior with other behavioral states. As expected, there was a significant main effect of behavioral state on theta power (repeated measures ANOVA excluding REM: F (2,8)=20.468, p=0.001), with higher theta power in exploratory behavior than quiet wakefulness and SWS (post hoc comparisons with run: quiet wakefulness, p=0.003; slow wave sleep, p=0.015; Figure 1L). Distributions of instantaneous Ca2+ event rates often had a small secondary peak above 0.5 Hz (Figure 1M). The majority of these Ca2+ event bursts, defined using this 0.5 Hz threshold, were movement-associated (p=6.5×10−5, paired t-test; Figure 1M). Even so, we did not detect a consistent relationship between animal speed and Ca2+ event rates at the individual or group level. Thus, dynamic Ca2+ activity varied dramatically with behavior and across the sleep wake cycle, with substantially higher rates of Ca2+ events during the high theta conditions of running behavior and REM sleep. Simultaneous dynamic calcium imaging and local field potential (LFP) recording in hippocampus across behavioral states. (A) Schematic. (B) Identified CA1 neurons for calcium imaging in a single freely behaving mouse. (C) Calcium activity of imaged neurons (20/130 neurons of one mouse are shown) across Awake (Left) and Sleep (Right) states. (D) Histogram of Ca2+ transient events of all 130 imaged cells (bin size, 500 ms). (E) Histogram of multi-unit activity (bin size, 50 ms). (F) 80–300 Hz spectrograms of LFP recorded in s. pyramidale during running behavior (Left) and sleep (Right), with LFP superimposed. 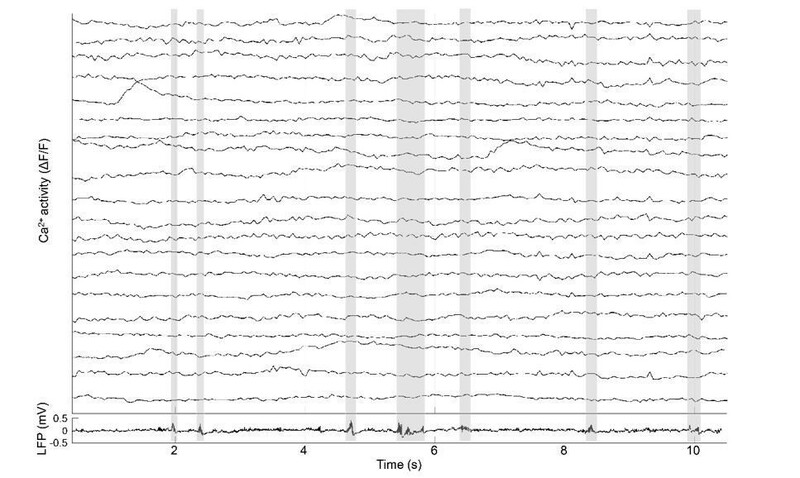 (G) 0–20 Hz spectrograms of LFP recorded in s. radiatum during running behavior (Left) and sleep (Right). 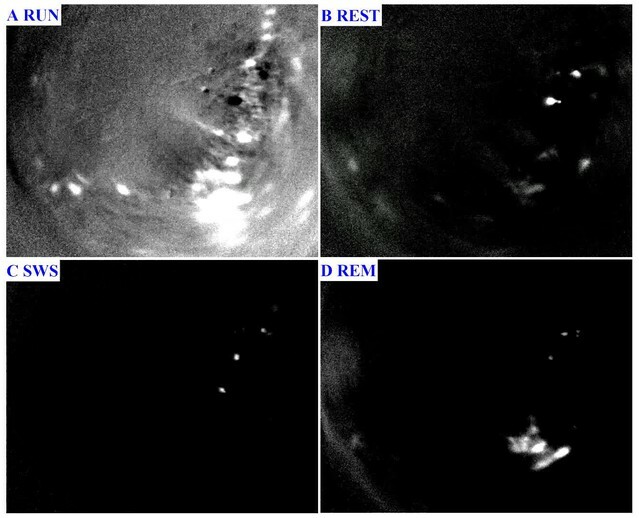 Insets: theta in s. radiatum during run behavior (Left, 2 s), two SWRs in s. pyramidale during slow wave sleep (Right, 2 s), theta in s. radiatum during REM sleep (Right, 2 s). (H) The animal’s position on the linear track (Left) and during the post-behavioral session (Right) as a function of time. (I) Calcium event rates within neurons were higher during run behavior and REM sleep than during quiet wakefulness (Rest) and slow wave sleep (SWS; n = 5 mice with 88, 119, 130, 134, 171 neurons). (J) Calcium event amplitudes within neurons were lower in SWS than in run behavior or rest. (K) Hippocampal multiunit activity (MUA) across behavioral states. A microscope-associated electrical noise artifact on the track prevented contrasts of multi-unit activity in run with other behavioral states. (L) Theta power is higher in run behavior than quiet wakefulness and SWS (n = 5 mice). As REM was identified on the basis of theta, REM was excluded from statistical contrasts. (M) Bursts of Ca2+ events (>0.5 Hz of instantaneous calcium rates) evident in inter-event interval histograms were more prevalent with movement (>0.5 cm/s; n = 6 mice). Statistical comparisons in I–L) were performed using one-way repeated measures ANOVA with post hoc tests. That of M) was performed with a paired t-test. *p<0.05, **p<0.01 and ***p<0.001. Representative calcium activity from a single mouse recording across the sleep-wake cycle. SWS (slow wave sleep), REM (rapid eye movement). Time: 20 s.
Because hippocampal LFP varies across behavioral states, we next sought to assess the relation of LFP state to neuronal Ca2+ activity. In SWR events, synchronized depolarizations drive large populations of CA1 neurons to fire. To determine whether such activity patterns are reflected in the coordination of neuronal Ca2+ activity with SWRs, as shown previously (Malvache et al., 2016), we evaluated Ca2+ activity triggered on SWR events (Figure 2). There was a significant main effect of timing relative to SWRs on Ca2+ event rates (repeated measures ANOVA: F (2, 14)=10.802, p=0.004; n = 8 mice; Figure 2J, left). Interestingly, this approach detected a robust reduction in somatic Ca2+ activity in association with SWRs, compared to baseline 2–5 s earlier and the immediate 1–2 s post-SWR period (post-hoc comparisons: Pre vs. SWR, p=0.022; Post vs. SWR, p=0.005; Figure 2E,F and J, left). SWRs were not associated with a detectable change in animal movement (speed, mean ± s.e. : Pre 1.7 ± 0.4 cm/sec, SWR 1.5 ± 0.3 cm/sec, Post 1.5 ± 0.4 cm/sec; ANOVA: F (2, 12)=1.71, p=0.23). Place cells, cells with Ca2+ event place fields on the track, showed a similar reduction of activity around SWR events (Figure 2—figure supplement 1). These results demonstrate marked modulation of Ca2+ activity around SWRs. Modulation of Ca2+transients at SWRs. (A) Temporal correspondence of simultaneously acquired dynamic calcium activity in 130 individual neurons with (B) CA1 multiunit action potentials as well as (C) ripple power and (D) LFP in a single freely behaving mouse. The dashed black line in (A) shows the global mean calcium activity. The red line in (C) reflects the threshold ripple power used to identify SWR events. (E) Raster and (F) peri-event time histogram of calcium events across all SWR events from the same mouse revealed a reduction of dynamic calcium activity that started before SWR onset. Raster and peri-event time histogram of calcium events across SWR singlets and across SWR trains are also shown. (G) Peri-event average neuropil fluorescence reveals SWR-associated calcium dynamics. (H) SWR-triggered multiunit action potentials and (I) pyramidal cell layer ripple power. Inset, expanded timescale. (J) Across all SWRs and SWR singlets, calcium transient rates at SWR onset (time = 0) were reduced compared to the preceding 2–5 s baseline and the 1–2 s post-SWR period (analysis times shown in F). After SWR trains, calcium rates were increased compared to baseline and SWR onset (n = 7 mice with 88, 112, 119, 130, 134, 171, 222 neurons). (K) Across all SWRs, the change in neuropil fluorescence was diminished in the post-SWR period (analysis times shown in (F); n = 6 mice). All events, all SWRs; Singlets, Single SWR event (separated by 1 s or more); Trains, SWR trains (doublets, triplets, etc.). (J–K) Statistics were performed using one-way repeated measures ANOVA with post hoc tests. *p<0.05, **p<0.01. The SWR-triggered reduction in dynamic Ca2+ activity started and was often greatest before the SWR began (minimum, mean ± s.e. : −0.075 ± 0.118 s). To refine the temporal relationship between Ca2+ activity and SWRs, we first accounted for the delay between Ca2+ transient detection, defined as the time at which the event reached 20% of its maximum amplitude, and the start of Ca2+ transients on average (0.114 ± 0.001 s; n = 7 mice). Accounting for this delay, the maximal reduction in Ca2+ activity preceded SWR onset by 0.189 ± 0.118 s. To enrich for dendritic Ca2+ activity capable of reflecting SWR-associated synaptic activity, we took advantage of extra-somatic GCaMP6f expression in dendrites (Chen et al., 2013) (Figure 2—figure supplement 2). Consistent with the capacity for Ca2+ imaging to detect the SWR-associated synaptic barrage with temporal fidelity, SWRs were associated with a time-locked (mean ± s.e. : −0.04 ± 0.10 s) change in the extra-somatic Ca2+ fluorescence of the neuropil, with a nonsignificant increase followed by a significant, delayed reduction (repeated measures ANOVA: F (2, 12)=15.627, p=0.003, n = 7 animals; post-hoc comparisons: Pre vs. SWR, p=0.130; Pre vs. Post, p<0.001; SWR vs. Post, p=0.003; Figure 2G and K, left). To independently assess the temporal alignment of the LFP and the Ca2+ fluorescence data, we placed a stimulating electrode in contralateral CA3 to activate the commissural pathway (Gruart et al., 2015; Dong et al., 2008) and evoke both a field EPSP and an associated change in GCaMP6f fluorescence in CA1 neurons. Stimulation evoked a field EPSP with mean latency 20.8 ± 0.7 ms and an associated increase in somatic Ca2+ fluorescence that started within 66.7 ± 16.7 ms (1.3 ± 0.3 samples) and peaked within 100 ± 0 ms (2 ± 0 samples; n = 3 animals; Figure 2—figure supplement 3). Accounting for this offset and the ~190 ms offset delineated above further advances the timing of dynamic Ca2+ activity relative to SWR onset. Together, these results support the observation that dynamic Ca2+ activity transiently falls in the immediate pre-SWR period. The unexpected absence of a detectable increase in Ca2+ activity at SWRs led us to consider the possibility that such an increase in Ca2+ activity may depend on SWR dynamics. We therefore compared Ca2+ activity triggered on single, isolated SWRs to Ca2+ activity triggered on trains of discrete SWRs (Buzsáki et al., 1983; Davidson et al., 2009) anticipated to provide a more effective somatic depolarization. Transient reduction of Ca2+ event rates was preserved when triggered on SWR singlets (repeated measures ANOVA: F (2, 14)=9.628, p=0.005; post-hoc comparisons: Pre vs. SWR, p=0.033; Post vs. SWR, p=0.007, n = 8 animals; Figure 2E,F and J, Middle), without clear evidence for a subsequent increase in Ca2+ event rates (Post vs. Pre, p=0.11). In contrast, when selectively triggered on the last SWR in a SWR train, Ca2+ event rates transiently increased (repeated measures ANOVA: F (2, 14)=9.145, p=0.003; post-hoc comparisons: Pre vs. SWR, p=0.447; Pre vs. Post, p=0.003; SWR vs. Post, p=0.010 n = 8 animals; Figure 2E,F and J, Right). SWR singlets and trains showed only trend level fluorescence changes in the neuropil (repeated measures ANOVA: Singlets: F (2, 12)=2.242, p=0.149; Trains: F (2, 12)=2.984, p=0.089; Figure 2G and K, Middle and Right). These results show that while a transient suppression of dynamic Ca2+ activity precedes SWRs, trains of temporally clustered SWRs are capable of eliciting a robust increase in dynamic Ca2+ activity. To further evaluate the relationship of SWR trains to Ca2+ activity, we also performed an inverse analysis, in which we evaluated the LFP associated with synchronous Ca2+ events across neurons. Synchronous events were relatively rare (10 ± 6 per recording, n = 6 animals). Even so, consistent with prior reports (Malvache et al., 2016), 12.6 ± 5.6% of synchronous Ca2+ events time coincided with SWRs. Compared to temporally shuffled data, 4.9 ± 3.1% of synchronous Ca2+ activities was associated with increased ripple power (p<0.05, n = 5 animals). These data confirm the capacity for synchronous Ca2+ events to coincide with SWRs. Thus, the SWR-synchronized depolarization of neurons, which is associated with hippocampal sequence replay and is implicated in memory consolidation (Buzsáki, 2015; Gomperts et al., 2015), was only associated with robust increases in dynamic Ca2+ activity in vivo when SWRs clustered in sets. Together, these results suggest that an underlying association of Ca2+ activity with hippocampal theta state and modulation of activity at SWR events contributed to the marked effect of behavioral state on neuronal Ca2+ activity. Previous work has shown that medial septum cholinergic neurons critically contribute to the hippocampal theta oscillation during exploratory behavior (Winson, 1978; Rawlins et al., 1979; Lawson and Bland, 1993; Vandecasteele et al., 2014) and that ACh can influence neuronal activity and drive release of Ca2+ from intracellular stores (Stutzmann and Mattson, 2011; Hasselmo, 2006; Giocomo and Hasselmo, 2005; Brown and Adams, 1980; Fernández de Sevilla and Buño, 2003; Cole and Nicoll, 1983; Power and Sah, 2002). We therefore pursued the hypothesis that medial septal cholinergic inputs contribute to hippocampal dynamic Ca2+ activity in freely behaving animals. 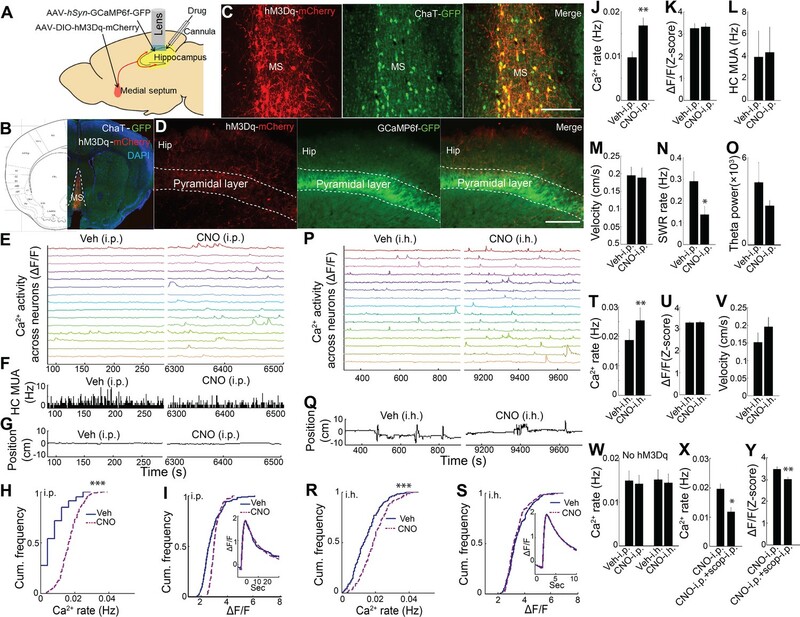 To determine whether medial septal cholinergic neuron activity was sufficient for the behavioral state- and theta- dependence of hippocampal Ca2+ activity, we injected AAV-hSyn-DIO-hM3D(Gq)-mCherry into the medial septum of ChAT-Cre mice and prepared mice for hippocampal dynamic Ca2+ imaging and LFP co-recording (Figure 3A; Figure 3—figure supplement 1). Immunohistochemistry confirmed selective expression of hM3Dq in cholinergic cells (Figure 3B,C). Upon injection of CNO, the hM3Dq ligand, the rate of dynamic Ca2+ activity during quiet wakefulness increased compared to injection of vehicle (p=0.005, paired t-test, n = 6; Figure 3E,H,J and Video 2). In contrast, hM3Dq activation of cholinergic cells did not increase the amplitude of Ca2+ events (p=0.677, paired t-test; Figure 3I,K) and did not change average hippocampal multiunit activity (p=0.461, paired t-test, n = 5; Figure 3F,L). In addition, CNO did not affect movement or other behaviors (p=0.3, paired t-test, n = 5; Figure 3G,M, Figure 3—figure supplement 2), including running velocity on the track (p=0.572, paired t-test, n = 5) or the proportion of time spent running (p=0.167, paired t-test, n = 5; Figure 3—figure supplement 3). CNO was associated with a reduction in the rate of SWRs (p=0.035, one tailed paired t-test; Figure 3N), consistent with prior reports (Vandecasteele et al., 2014; Norimoto et al., 2012), but did not significantly alter hippocampal theta power in quiet wakefulness or exploratory behavior (each contrast, p=0.290, paired t-tests, n = 5; Figure 3O). Neither CNO-associated changes in SWR rates (p=0.4, Spearman) nor changes in theta power (p=0.7, Spearman) significantly correlated with CNO-associated changes in Ca2+ event rates. To evaluate for CNO off-target effects (Gomez et al., 2017), CNO was injected in animals lacking hM3Dq receptor expression. No effect was observed on the rate of dynamic Ca2+ activity (Ca2+ event rates, p=0.496; amplitudes, p=0.710; paired t-test, n = 5; Figure 3W and Figure 3—figure supplement 4). These data show that activation of medial septal cholinergic neurons was sufficient to impact hippocampal LFP state and to increase neuronal Ca2+ activity. Chemogenetic activation of septal cholinergic neurons increased CA1 dynamic calcium activity in ChAT-Cre mice. (A) Schematic for local injection. (B) Immunohistochemistry shows the expression of hM3Dq in the medial septum (MS) and (C) colocalization with cholinergic neurons (yellow): Red, anti-mCherry for hM3Dq; GFP, anti-ChAT. (D) The axons of cholinergic neurons expressing hM3Dq were also detected in the hippocampus, where CA1 neurons expressed GCaMP6f (GFP). Calibration bar: 200 μm. (E) Systemic (i.p) CNO injection (Right) increased calcium activity in individual neurons compared to vehicle (Left) (15/237 neurons of one mouse are shown). (F) Histogram of hippocampal multiunit activity (MUA). (G) Animal position during quiet wakefulness. (H) CNO injection increased calcium event rates within neurons but not (I) calcium event amplitudes. Inset, average Ca2+ event waveforms after vehicle and after CNO injection. Group data (n = 6 mice with 65, 98, 119, 184, 212, 237 neurons) show the effects of cholinergic activation with hM3Dq on (J) calcium event rates and (K) calcium event amplitudes. (L) Systemic CNO injection did not change hippocampal MUA (n = 5), (M) Velocity in the post-behavioral session after vehicle and CNO (i.p.) injection. (N) Systemic CNO injection reduced the rate of SWRs (n = 5 mice). (O) CNO injection did not change theta power. (P) Intrahippocampal (i.h.) CNO injection (Right) increased calcium activity across individual neurons compared to vehicle (Left) (15/212 neurons of one mouse are shown). (Q) Animal position in quiet wakefulness. (R) CNO i.h. injection increased calcium event rates within neurons but not (S) calcium event amplitudes. Inset, average Ca2+ event waveforms after vehicle and after CNO. Group data (n = 5 mice with 94, 113, 206, 212, 250 neurons) show the effects of local CNO injection on (T) calcium event rates and (U) amplitudes. (V) CNO i.h. injection did not affect animal velocity. (W) Neither i.p. nor i.h CNO injection affected calcium activity in mice without hM3Dq injection in the medial septum. The effects of CNO i.p. injection on (X) calcium rates and (Y) amplitudes were blocked with scopolamine. Statistics were performed using paired t-tests, *p<0.05, **p<0.01, ***p<0.001. Representative calcium activity after Vehicle and CNO injections (i.p. or i.h.). We next sought to confirm that these results could be recapitulated via activation of septal cholinergic afferents to the hippocampus. Consistent with prior reports (Teles-Grilo Ruivo and Mellor, 2013), after expression of hM3Dq in medial septal cholinergic neurons, hM3Dq-containing axons could be observed in CA1 (Figure 3D). 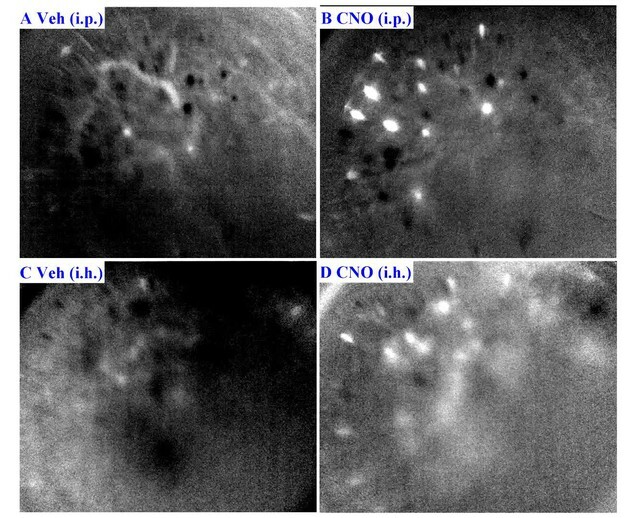 We therefore directly injected CNO into the dorsal hippocampus ipsilateral to the microscope while imaging Ca2+ activity. Compared to intra-hippocampal injection of vehicle, intra-hippocampal injection of CNO increased the rate of CA1 neuronal Ca2+ activity (p=0.008, paired t-test; n = 5; Figure 3P,R,T and Video 2) without affecting Ca2+ event amplitudes (p=0.810, paired t-test; Figure 3S,U) or animal behavior during quiet wakefulness (p=0.248, paired t-test; Figure 3Q,V). Intra-hippocampal injection of CNO in animals lacking hM3Dq receptor expression (Gomez et al., 2017) did not alter on the rate of dynamic Ca2+ activity (Ca2+ event rates, p=0.637; amplitudes, p=0.128; paired t-test, n = 4; Figure 3W and Figure 3—figure supplement 4). The effect of hM3Dq activation of cholinergic cells on CA1 Ca2+ activity was also mAChR-dependent, as hippocampal neuronal Ca2+ activity after hM3Dq activation of cholinergic cells was robustly inhibited with mAChR antagonist scopolamine injection (i.p.) (Ca2+ event rates, p=0.014; amplitudes, p=0.001; paired t-tests, n = 5 mice; Figure 3X,Y). To determine whether endogenous muscarinic ACh receptor (mAChR) activation mediated the dependence of dynamic Ca2+ activity on behavioral and theta state, we again employed the selective mAChR antagonist scopolamine in WT animals. Scopolamine systemic treatment markedly reduced hippocampal dynamic Ca2+ event rates and amplitudes during exploratory behavior (rate: p=0.014; amplitude: p<0.001, paired t-tests, n = 7; Figure 4A–G and Video 3). In contrast, scopolamine did not diminish average hippocampal multiunit activity (exploratory behavior, p=0.087, paired t-tests, n = 6, Figure 4H; quiet wakefulness, p=0.9). Scopolamine also increased SWR event rates during periods of quiet wakefulness (p=0.012, paired t-test; Figure 4I) and increased theta power during exploratory behavior (p=0.05, paired t-test, n = 7; Figure 4L). Neither scopolamine-associated changes in SWR rates (p=0.3, Spearman) nor changes in theta power (p=0.14, Spearman) significantly correlated with changes in Ca2+ event rates. Scopolamine did not affect the fraction of time spent running on the track (p=1.0, paired t-test, n = 7; Figure 4K) but was associated with a mild reduction in running speed without an effect on other behaviors (p=0.023, paired-test; Figure 4J, Figure 4—figure supplement 1, and Figure 4—figure supplement 2). Thus, the effects of behavioral state and endogenous septal neuron activation on dynamic Ca2+ activity were likely mediated by mAChRs. Hippocampal dynamic calcium activity was mAChR dependent. Representative calcium activity after Vehicle and Scopolamine injections (i.p. or i.h.). To confirm that the effect of scopolamine on hippocampal Ca2+ activity required inhibition of dorsal CA1 mAChRs, we evaluated the effect of intra-hippocampal injection of scopolamine on dynamic Ca2+ activity. Compared to injection of vehicle, intra-hippocampal injection of scopolamine was associated with a significant reduction in both neuronal Ca2+ event rates (p=0.043, paired t-test; Figure 4M,O,Q and Video 3) and amplitudes (p=0.038; Figure 4P,R), without significantly affecting behavior (speed in quiet wakefulness, p=0.081; Figure 4S). Thus, hippocampal dynamic Ca2+ activity was dependent on mACh receptor-mediated signaling in CA1. These data confirm a critical role for medial septal cholinergic neuron-mediated activation of mAChRs in hippocampal dynamic Ca2+ activity in freely behaving animals. We combined dynamic Ca2+ imaging of hippocampal CA1 neurons with local LFP recordings in order to relate dynamic Ca2+ activity to behavioral and hippocampal state. We found that dynamic Ca2+ activity was greatest in exploratory behavior and secondarily in REM sleep, states characterized by strong hippocampal theta oscillations, with marked reductions in quiet wakefulness and slow wave sleep, both non-theta states. Although these findings resemble the state-dependence of pyramidal cell action potential firing rates, which are highest in active wakefulness and REM sleep (Grosmark et al., 2012; Miyawaki and Diba, 2016), mean Ca2+ event rates were comparable in quiet wakefulness and slow wave sleep. In addition, neuronal firing rates appear to change less markedly with state than dynamic Ca2+ activity. These results contrast with wide-field calcium imaging in cortex, where Ca2+ activity has been shown to fall in SWS compared to wakefulness, consistent with the present results, but with greatest reduction in REM sleep (Niethard et al., 2016). Together, these observations suggest that state-dependent and cholinergic effects on dynamic Ca2+ activity may not be uniform across brain regions. 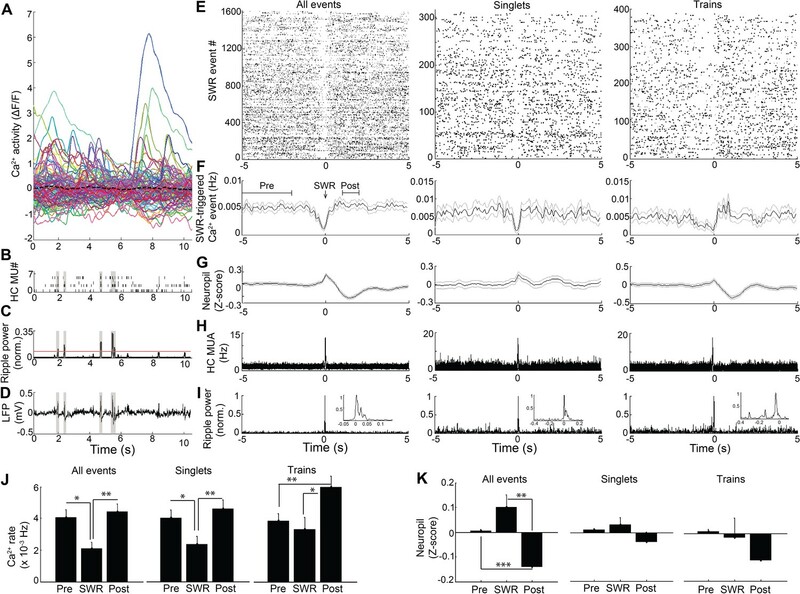 Whereas action potentials of CA1 neuronal populations coordinate robustly with SWR events in both wakefulness and sleep (Buzsáki, 2005; Buzsáki, 2015; Grosmark et al., 2012; Miyawaki and Diba, 2016), dynamic Ca2+ activity of imaged neurons detectably increased only in association with SWR trains and was not evident with SWR singlets or across SWRs on average. While it remains possible that neuronal firing during single SWRs increases cytoplasmic Ca2+ levels, perhaps via Ca2+ transients that follow LFP-detected SWRs, such activity was insufficiently robust to increase average Ca2+ transient rates. This result may derive from the prominent contribution of inhibition during SWRs coupled with potential effects of SWR trains on the post-SWR hyperpolarization (Gan et al., 2017; Hulse et al., 2016; English et al., 2014; Maier et al., 2011). These differences in Ca2+ activity across SWR singlets and trains may reflect a distinct role for dynamic Ca2+ activity in trains, for example in binding together the representations of SWRs that comprise a train (Davidson et al., 2009; Yamamoto and Tonegawa, 2017). Analyses of SWR-associated Ca2+ activity also revealed a reduction in Ca2+ transient rates prior to SWRs. Small systematic delays in detection of Ca2+ signaling relative to electrophysiological events contribute to the estimated timing of Ca2+ transient suppression relative to SWRs. Studies linking the action potential to Ca2+ transients suggest a lag less than 20 ms based on the rise time constant (Jaffe et al., 1992; Markram et al., 1995; Sah and Clements, 1999). However, GCaMP6f’s rise time constant, ~50 ms at body temperature (Ohkura et al., 2012), also contributes. This lag is offset by the ~2–4 ms delay associated with extracellular SWR detection (Hulse et al., 2016). Consistent with these expectations, we observed a small (<46 ms) delay between evoked fEPSP and somatic Ca2+ fluorescence increases, and in addition observed temporal coincidence of SWRs with neuropil-associated Ca2+ activity within the resolution of the 50 ms imaging sampling interval. Accounting for this delay and the offset between Ca2+ transient initiation and detection further advances the timing of Ca2+ transient reduction relative to SWR onset, suggesting that the SWR-associated reduction in dynamic Ca2+ activity does indeed precede SWR onset. Modulation of hippocampal activity by a neocortical DOWN state that precedes SWR events may contribute to the observed suppression of Ca2+ transients prior to SWRs (Sirota et al., 2003; Isomura et al., 2006; Hahn et al., 2007; Hahn et al., 2012); see also 53,54), as may reduced levels of acetylcholine. As septal cholinergic neuron activity contributes to theta and reduces SWRs (Hasselmo, 2006; Vandecasteele et al., 2014; Norimoto et al., 2012), we evaluated the contribution of medial septal cholinergic neurons to hippocampal dynamic Ca2+ activity. We found that chemogenetic activation of medial septal cholinergic neurons with hM3Dq increased dynamic Ca2+ activity while reducing SWR rates. In contrast, inhibition of mAChRs markedly reduced dynamic Ca2+ activity while increasing SWRs. Neither chemogenetic activation of cholinergic neurons nor mAChR inhibition altered hippocampal multiunit activity. Although this might be taken as further support of a dissociation between Ca2+ activity and action potentials, lack of isolated single units limits interpretation of this observation. Nonetheless, these findings are consistent with reports in reduced preparations showing that mAChRs contribute to somatic Ca2+ transients (Power and Sah, 2002; Cho et al., 2008; Müller and Connor, 1991). 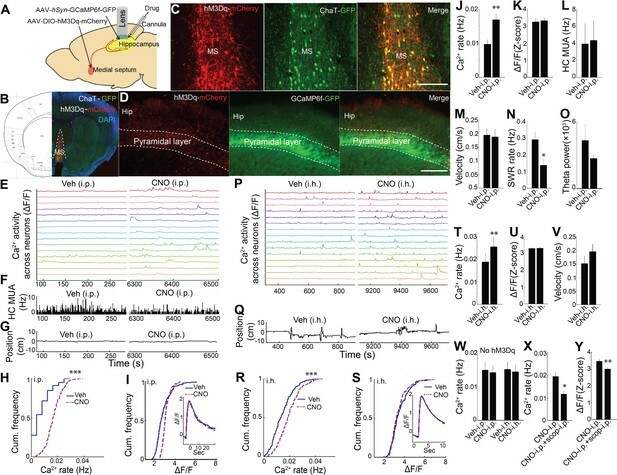 They demonstrate that medial septal cholinergic activity through activation of mAChRs critically regulates hippocampal dynamic Ca2+ activity in vivo, in relation to behavioral and theta state. Multiple factors may contribute to the apparent dissociation of dynamic Ca2+ activity and action potential-associated activity in slow wave sleep. The observed dependence of dynamic Ca2+ activity on mAChR activation suggests that low cholinergic tone and thereby reduced mAChR activation may be a critical determinant. In addition, although instantaneous firing rates during theta and SWR events are comparable, differences in spike counts and in patterned activity between these hippocampal oscillations may also contribute. In this respect, it is notable that complex spiking, which has been observed in theta-associated exploratory behavior (Epsztein et al., 2011; Cohen et al., 2017; Bittner et al., 2015; Bittner et al., 2017), is particularly effective at driving somatic Ca2+ influx (Grienberger et al., 2014), while cells typically fire only a few action potentials during SWRs which may be less effective at generating a detectable Ca2+ transient. Finally, distinct spatial compartmentalization of Ca2+ and differential kinetics and peak concentration of somatic Ca2+ transients during exploratory behavior and REM sleep compared to quiet wakefulness and slow wave sleep associated with SWR events may also contribute to the apparent dissociation, and the possibility remains that non-theta states are associated with somatic Ca2+ event amplitudes below the resolution of the in vivo microendoscopy technique used here. ACh plays a critical role in memory formation (Teles-Grilo Ruivo and Mellor, 2013; Hasselmo, 2006). The high levels of somatic Ca2+ activity observed during exploratory behavior-associated theta states that have been implicated in memory encoding (Buzsáki, 2005; Hasselmo, 2006), coupled with the lack of a robust increase in association with most SWR events implicated in memory consolidation (Buzsáki, 2015), suggests that dynamic Ca2+ events may contribute preferentially to theta-dependent processes such as memory encoding. As a result, Ca2+ dependent gene expression is likely to be enriched in theta-associated exploratory behavior and REM sleep relative to SWR-associated states of quiet wakefulness and slow wave sleep. Even so, the capacity for Ca2+ events to coordinate differentially with SWR trains over single SWRs raises the possibility that Ca2+ may participate in integrating the representations of extended replay across SWRs. Theta-associated mAChR-dependent cascades that require somatic Ca2+ transients may also contribute to hippocampal representations, including place field formation, gain of response (Cohen et al., 2017), and stabilization, via both direct effects on ionic conductances as well as effects on Ca2+ dependent kinases, phosphatases, and gene expression. NMDA receptor activation (Silva et al., 2015) and (intracellular) complex spikes (also referred to as Ca2+ plateau potentials; Epsztein et al., 2011; Bittner et al., 2015; Bittner et al., 2017; Grienberger et al., 2014; Takahashi and Magee, 2009; Harvey et al., 2009) may participate in this process. In contrast, in non-theta states, low levels of mAChR-dependent somatic Ca2+ would be anticipated to limit activation of Ca2+ dependent intrinsic conductances and second messenger systems, favoring SWR-associated replay and reducing Ca2+-dependent gene expression. In the hippocampal slice, activation of mAChRs has been shown to increase intracellular and nuclear Ca2+ through Ins-P3 dependent Ca2+ release from intracellular stores (Power and Sah, 2002; Cho et al., 2008). This mechanism may contribute to the actions of ACh in freely behaving animals, driving LTP (Malenka et al., 1988; Dennis et al., 2016) and Ca2+ dependent gene transcription necessary for memory formation (Bading, 2013). 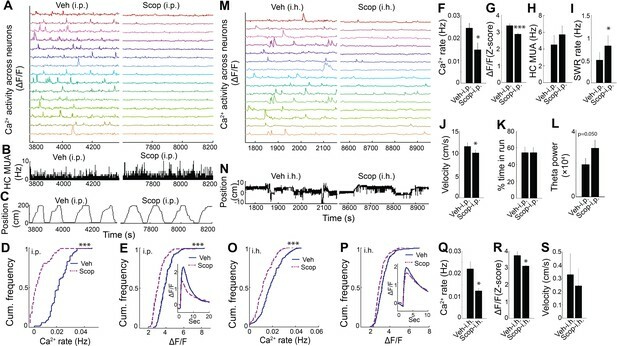 The results of this study implicate cholinergic-dependent dynamic Ca2+ activity in the molecular cascades necessary for hippocampal memory formation, preferentially during the theta-associated states of exploratory behavior and REM sleep. Impairment of such processes may contribute to hippocampal failure in diseases such as Alzheimer’s disease, where loss of cholinergic neurons and Ca2+ dyshomeostasis have been described (Schliebs and Arendt, 2011; Magi et al., 2016; Berridge, 2014) and where cholinesterase inhibitors are the only class of drug that consistently improves memory in clinical trials (Birks et al., 2015; Birks, 2006). All procedures were approved by the Institutional Animal Care and Use Committees of the Massachusetts General Hospital and followed the ethical guidelines of the US National Institutes of Health. Adult male C57BL/6J mice underwent injection of 1 µL AAV-hSyn-GCaMP6f-GFP (titer ~1013 mL−1) into the CA1 region of the hippocampus (anterior-posterior (AP) −2.1 mm, medial-lateral (ML) −1.65 mm, dorsal-ventral (DV) −1.4 mm from Bregma) at 0.2 µL/min under anesthesia (induction and maintenance, isoflurane 0.5–2%), followed by implantation of grin lens above CA1 (DV −1.2 mm from brain surface), as previously described (Ziv et al., 2013). A 16-contact linear probe (Neuronexus) or a probe containing eight independently drivable stereotrodes was implanted and lowered into position to sample the ipsilateral CA1 region in the vicinity of the lens, spanning the pyramidal cell layer and including s. radiatum (AP −2.8 mm, ML 2.6 mm from Bregma, −36 o relative to the AP axis, −39 o relative to the inter-aural axis; DV −1.7 mm from brain surface). Stereotrodes were adjusted over several days to reach the pyramidal cell layer. Electrodes reliably terminated under the lens. An electrically silent contact, typically the most superficial, served as the reference, with cerebellar ground. For stimulation experiments, an additional stimulus probe made by gluing together a pair of twisted Teflon-coated 90% platinum/10% iridium wires (50 µm inner diameter, 100 µm outer diameter, World Precision Instruments, USA) was implanted into the contralateral CA3 (AP −2.8 mm, ML −3.05 mm from Bregma, −36 o relative to the AP axis, −39 o relative to the inter-aural axis; DV −1.5 mm from brain surface). GCaMP6f expression, lens placement, and probe electrode positions were confirmed with postmortem evaluation and histology (Figure 1—figure supplement 1). 10 mice received the linear probe; 4 mice received the stereotrode implant. As tabulated below, for assessment of Ca2+ activity and LFP across the sleep wake cycle (Figure 1), 2 mice had the linear probe and 3 mice had stereotrode implants; for assessment of Ca2+ activity in relation to sharp wave ripples (Figure 2), 4 mice had the linear probe and 4 mice had stereotrode implants; for assessment of hM3Dq activation (Figure 3), 5 mice had the linear probe and no mice had stereotrode implants; for assessment of scopolamine (Figure 4), 5 mice had the linear probe and 1 mouse had stereotrode implants. For stimulation experiments, 3 mice received the stereotrode implant in ipsilateral hippocampus with a stimulus probe in contralateral hippocampus (Figure 2—figure supplement 3). For chemogenetic experiments, adult ChAT-Cre mice (The Jackson laboratory strain B6:129S6-Chattm1(cre)Low1) underwent injection of 0.5 µL AAV-hSyn-DIO-hM3D(Gq)-mCherry (titer ~1013 mL−1) into the medial septum (AP 0.86 mm, ML −0.5 mm, 6.4o from vertical, DV −4.5 mm from Bregma), as well as 1 µL GCaMP6f virus injection into the hippocampus. For DREADD experiments, animals were first recorded after systemic vehicle injection (i.p, 10 ml/kg in volume) and were then recorded 30 min after clozapine-N-oxide injection (CNO, 1 mg/kg i.p), the DREADD ligand. For hM3Dq experiments, one mouse’s electrophysiological probe broke. For intracranial pharmacology experiments, a cannula (26 GA) was placed 1 mm above the dorsal hippocampus, ipsilateral to the miniature microscope (AP −2.8 mm, ML 2.6 mm from Bregma, −36 o relative to the AP axis, −39 o relative to the inter-aural axis; DV −0.7 mm from brain surface). Cannula-implanted mice did not undergo implantation of hippocampal electrophysiology probes; instead, skull screws were implanted for EEG for purposes unrelated to the present study. To directly target local hippocampal mAChRs and the cholinergic projection to the hippocampus, animals were first recorded after intrahippocampal injection (i.h., 1 µL in volume, 0.1 µL/min) of vehicle and were then recorded 30 min post 1 µl scopolamine (2 µg/µl, i.h.) or clozapine-N-oxide solution (300 µmol/L, i.h.) injection via the cannula. To assess the accuracy of cannula placement and determine the center of local injection, 0.2 µL trypan blue solution was directly injected into the hippocampus; 1 µL trypan blue injection was used to assess the extent of diffusion (Figure 3—figure supplement 1). To test the effects of mAChR inhibition, animals were first recorded after systemic vehicle injection (i.p., 10 ml/kg in volume) and were then recorded 15 min after scopolamine injection (1.5 mg/kg, i.p.). To control for temporal stability of dynamic Ca2+ activity, we also assessed recordings in which vehicle was injected both at baseline and in lieu of drug. Animals treated sequentially with vehicle showed stable Ca2+ activity during both exploratory behavior and periods of quiet wakefulness (run behavior, Ca2+ event rate (mean ± s.e. ): vehicle1 0.023 ± 0.005, vehicle2 0.026 ± 0.006, p>0.05, paired t-test; amplitude: vehicle1 3.10 ± 0.05, vehicle2 2.98 ± 0.07, p>0.05, paired t-test; quiet wakefulness, Ca2+ event rate (mean ± s.e. ): vehicle1 0.016 ± 0.001, vehicle2 0.015 ± 0.001, p>0.05, paired t-test; amplitude: vehicle1 3.25 ± 0.13, vehicle2 3.08 ± 0.09, p>0.05, paired t-test; n = 3). The InscopixTM mini-microscope and acquisition system was used for Ca2+ imaging. Frame rate was 20 fps (50 ms exposure time). Local field potentials (2 kHz sampling, 0.5–900 Hz filtering) were recorded from each contact site on the probe (NeuralynxTM). For multiunit recordings, 1 ms windows around thresholded extracellular action potentials were acquired on-line at 32 kHz, 600–6000 Hz filtering. Head position and direction were monitored with overhead camera tracking of two diodes mounted on the headstage. Animals were trained over 1–2 weeks to run on a linear track (200 cm) between two goal locations. Electrophysiological recordings were acquired throughout behavioral sessions. Ca2+ imaging was acquired simultaneously but in 10 min increments, with 4–6 min periods off-camera to minimize photobleaching. Rest sessions were acquired immediately after behavioral sessions in a sleep chamber within the recording room. Animals were housed in individual cages with a 12 hr light-12h dark standard light cycle. Exploratory behavior was defined as running behavior (>3 cm/sec) on the linear track. Quiet wakefulness, slow wave sleep, and REM sleep were scored in the sleepbox. Quiet wakefulness was classified during periods of wakeful immobility (<0.5 cm/sec), both prior to sleep and following arousal events and postural changes. Slow wave sleep was classified by irregular activity and SWRs arising in the setting of prolonged immobility (at least 3 min) in a sleep posture. REM sleep was classified by high theta power (5–12 Hz) in the LFP arising out of slow wave sleep in association with persistent immobility, with each epoch of REM lasting at least 10 s. Where available (3/5 animals), EMG confirmed classification. For stimulation experiments, a Master 8 (AMPI) was used to drive the stimulus isolator (WPI) to produce an input electric current through the (contralateral) stimulating electrode (1 ms duration, 15–20 s interval). This was calibrated to generate field EPSPs on the (ipsilateral) recording stereotrodes which were recorded along with simultaneous calcium imaging. Recordings were performed under isoflurane. Established software was used for initial processing of Ca2+ activity (Mosaic, Inscopix, Palo Alto, California). This includes Ca2+ data registration, using rigid-body motion correction as required, followed by PCA/ICA analysis of ΔF/F datasets, as described previously (Mukamel et al., 2009). Matlab (MathWorks, Natick, Massachusetts) was used for further data analysis. ICs were reviewed manually, and the IC spatial masks were applied to the ΔF/F datasets to derive ΔF/F time series for each soma. For stimulation experiments, the ΔF/F time series were taken from the ICs directly; similar results were obtained using IC spatial masks. Unless otherwise stated, error bars reflect s.e.m. Ca2+ events were identified as threshold crossings of IC traces. Threshold was defined as 3 Z scores above the mean for analyses of dynamic calcium activity across behavior and LFP states. In order to be sensitive to changes in Ca2+ event amplitudes with experimental manipulations of the cholinergic system, the threshold for these analyses was taken as 2 Z scores above the mean. Similar results were observed using a threshold of 3 Z scores. The start of each event was defined as the time at which the event reached 20% of its maximum amplitude. To compute the neuropil trace, a region of interest (ROI) was selected that contained all identified somas. From this ROI, we took the maximum intensity of each pixel across the set of normalized ICs to generate a distribution. The set of neuropil pixels was then defined as those pixels lying below the median of this distribution. The neuropil trace was taken as the integral of the ΔF/F time series over the set of neuropil pixels. Local field potentials across the probe contacts were reviewed and filtered to obtain hippocampal ripples (Blackman filter; 80–400 Hz), theta (5–12 Hz), and delta oscillations (0.5–4 Hz). Channels with strong SWRs and unit activity were taken to be in the pyramidal cell layer and were used for analysis of ripples and multiunit activity. For linear probes, a contact in s. radiatum 100 μm below the cell layer was used for theta and delta. For stereotrode implants, a stereotrode below the cell layer was used for theta and delta. Methods for detecting SWRs and theta were the same for the different types of recordings. SWR events were identified in the sleep chamber and defined using a 3 Z score threshold of ripple power, with the start and end defined as the times at which ripple power returned to the mean, and with a 20 ms minimum duration. Trains of SWRs were identified when the interval between discrete SWRs was less than 1 s. Multiunit activity was selectively analyzed from sites estimated to be in the pyramidal cell layer. Because camera-associated high frequency (1.3 kHz) electrical noise variably contaminated some contacts, action potentials that exceeded threshold were screened on the basis of waveform, and events contaminated with at least 40 μV of 1.3 kHz noise were excluded. Action potentials thus filtered were aggregated as multiunit activity for further analyses. High frequency microscope-associated electrical noise was minimal in the post-behavioral session but was often substantial on the track, prohibiting multiunit contrasts between exploratory behavior and other behavioral states. Spectrograms were assessed from 0 to 20 Hz using a moving window of size 4 s and step size 100 ms, and from 80 to 300 Hz using a moving window of size 100 ms and step size 10 ms, using the Chronux toolbox http://chronux.org/. Ca2+ events associated with SWRs were summed over repeated SWRs to generate peri-event time histograms (PETHs) triggered on the start of SWR events, which were smoothed with a Gaussian window (σ = 50 ms). Baseline Ca2+ activity was taken from −5 to −2 s prior to the start of SWR events. Across all SWRs, SWR-associated Ca2+ activity was measured at SWR onset. Delayed Ca2+ activity was measured 1–2 s after the SWR. For SWR singlet versus train analyses, SWR-associated Ca2+ activity was measured at SWR offset, and delayed Ca2+ activity was measured within 3 s of the SWR in a 500 ms window centered around the maximum. Synchronous Ca2+ events (SCE) were identified when the number of cells with Ca2+ event onsets within a 250 ms window exceeded the number expected by chance, as defined by >3 s.d. after 1000 temporal shuffles of cell activity, and with a minimum of 5 participating cells (Malvache et al., 2016). The onset time of the first transient within the SCE was used to relate SCEs to ripples. A co-occurrence was identified when SCEs started within −100/+150 ms of ripples. Significant ripple-associated SCEs were identified when their ripple power exceeded the median + twice the interquartile range of the distribution of ripple power associated with 1000 temporal shuffles of SCE times. For place field assessment, spatial tuning curves (3 cm bins) were constructed for each running direction using all detected Ca2+ events that occurred during run behavior (>3 cm/sec). Spatial information was measured for each spatial tuning curve and compared to spatial information distributions of 1000 shuffled versions of the data to test significance (Monte Carlo p-value<0.05) (Markus et al., 1994). In each shuffle, Ca2+ events were reassigned to random times and spatial information was recomputed. All group values were represented as mean ± s.e.m. Student paired t-test and one-way ANOVA with repeated measures followed by post hoc tests were used for statistical analyses according to experimental designs (SPSS 13.0 version) (Supplementary file 1). The significance level was set at p<0.05. Animals were injected with Fatal plus (100 mg/kg, i.p.) and perfused with 4% paraformaldehyde solution. Probe and lens locations were assessed (Figure 1—figure supplement 1). Brains were removed and cut in coronal sections with a cryostat (50 µm-thickness). Expression of hM3Dq was assessed using mCherry antibody (ab167453, 1:500, Abcam), along with anti-ChAT antibody (AB144P, 1:100, Millipore). 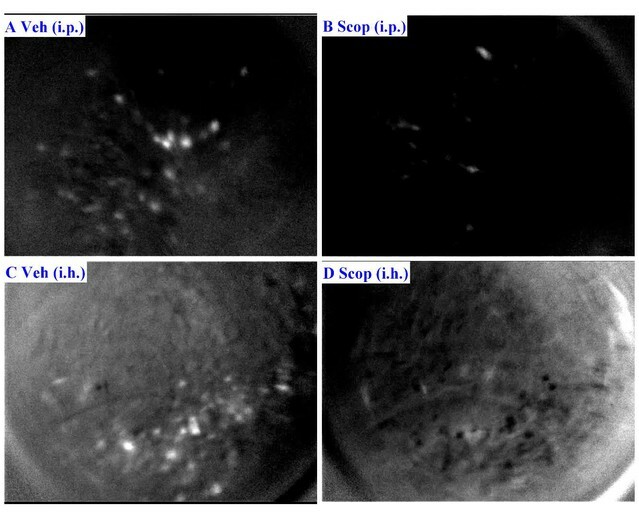 Fluorescence expression and electrode location were evaluated with microscopy (Zeiss Axio Imager Z2, Germany). The Journal of Physiology 592:281–293. The Cochrane Database of Systematic Reviews CD005593. The Cochrane Database of Systematic Reviews 9:CD001191. The Journal of Neuroscience 34:16509–16517. European Journal of Neuroscience 17:555–558. European Journal of Neuroscience 22:1349–1356. Current Opinion in Neurobiology 16:710–715. The Journal of Physiology 485:1–20. The Journal of Neuroscience 22:3454–3462. The Journal of Neuroscience 19:3657–3664. Frontiers in Synaptic Neuroscience 5:2. Thank you for sending your article entitled "Cholinergic modulation of hippocampal calcium activity across the sleep-wake cycle" for peer review at eLife. Your article has been reviewed by three peer reviewers, one of whom is a member of our Board of Reviewing Editors, and the evaluation has been overseen by Michael Frank as the Senior Editor. All reviewers agreed that your study addresses important questions, namely how calcium dynamics depend on behavioral states, how calcium activity relates to hippocampal network states (i.e., theta vs. sharp wave-ripples), and how imaged calcium activity is affected by cholinergic neuromodulatory inputs from the medial septum. All reviewers agreed that your paper potentially shows important and interesting results and uses an impressive combination of techniques. However, reviewers also agreed that the conclusions are not convincingly supported by the results as currently described. A major concern is a lack of control animals receiving CNO injections in the absence of DREADD expression. Another major concern is whether the timing of calcium transients and sharp wave-ripples could be compared with sufficient temporal resolution in order to convincingly conclude that calcium activity decreases during extracellularly recorded sharp wave-ripples. The essential revisions are listed below, roughly in order of importance, and these are the points that should be addressed. These essential revisions are followed by the three reviews in their entirety, for your information. 1) An important control is missing from these experiments. The authors did not examine the effects of CNO alone, without hM3Dq receptor expression (Gomez et al., Nature 2017). CNO can also bind to other endogenous receptors. Thus, controls with only CNO injected (in absence of DREADDs) are needed to determine whether the reported changes in calcium activity in the chemogenetic manipulation experiments are not due to effects caused by CNO itself. 2) The possibility that transients are suppressed during SWRs could be very interesting, but there was insufficient accuracy and confidence in the temporal resolution to draw any conclusions. It is difficult to determine the exact onset of a calcium transient at the timescales necessary for any firm conclusions. Furthermore, one cannot be certain whether or not there is a systematic lag between electrophysiological and calcium events in the recordings. So, it remains possible that neuronal firing during SWRs produces calcium transients that are observed slightly after LFP-detected ripples. 3) How exactly were exploratory behaviors, slow wave sleep, and REM sleep identified and defined? The authors report that these states were associated with different theta/δ ratios, but theta/δ ratios are typically used to differentiate REM sleep from slow wave sleep, thus making this "result" a consequence of the method. Also, the theta/δ ratio in Figure 1 does not show a significant increase in the run versus rest behavioral state. This is important for the paper, and the authors should explain this apparently anomalous result. Moreover, the authors state in the Results section that "As expected, both exploratory behavior and REM sleep were associated with a high theta/δ ratio, which diminished in quiet wakefulness and slow wave sleep (repeated measures ANOVA: F (3, 12) =3.965, p>0.05; Figure 1I)"; However, their statistical results do not seem to support this statement. The authors should show group-averaged or individual power spectrum analysis of theta power changes with behavior states along with theta/δ ratios and clarify these puzzling results. 4) Activation of either cholinergic cells in MS or their axonal inputs to hippocampus, reportedly leads to increased rates of calcium events during quiet wakefulness. However, even though both i.p and i.h injections of CNO to activate either the cholinergic cells in MS or cholinergic inputs to hippocampus, respectively, were reportedly done during quiet wakefulness, the running velocities in Figure 3L and Figure 3T are very different. Why is this? Also, running speeds greater than 5 cm/s, as shown in Figure 3L, are not typically considered quiet wakefulness. Similarly, mAChR inhibition carried out by either i.p or i.h injection in Figure 4 both resulted in decreases in the rate of calcium events. However, the measured running velocities shown in Figure 4H and 4P are significantly different. In which behavioral states were these manipulations carried out? 5) Since the central point of this manuscript is a link between behavioral states and calcium dynamics, it would be crucial to provide evidence of the behavioral state in which each of the manipulations were carried out to evoke changes in calcium dynamics. Thus, it would be useful to have pre-injection and post-injection comparisons of behavioral state and calcium dynamics. The measures and statistics shown are insufficient in this regard. 6) Related to the above point, the corresponding increase or decrease of theta power upon activation or inhibition of the cholinergic system would be useful to correlate with the various manipulations and calcium activity changes. 7) The details about electrophysiological recordings are unclear. The authors state that they used a 16-contact linear probe in some animals, or 8 independently drivable stereotrodes in other animals. It is unclear how many mice had each kind of recording. Also, which channels were used for analyses? Also, were the methods for detecting sharp wave-ripples and theta the same for the different types of recordings? 8) Related to the above point, the authors also state that a skull screw was used to obtain EEG recordings in animals with cannula. How were the authors certain that sharp wave-ripples and theta could be detected from a skull screw? The authors need to provide example recordings to demonstrate that these patterns could be detected. 9) Was multiunit activity recorded from all depths/recording sites of the probes or just those sites estimated to be in stratum pyramidale? This is important to assess the likelihood that multiunit recordings included mostly interneuron spikes or more likely picked up mostly pyramidal cell activity. 10) Related to the above point, MUA activity should be shown alongside the calcium transients throughout the figures in the paper. 11) The reported silence in calcium transients prior to SWRs is interesting, but seems to follow from prior observations by Sirota et al., 2003 and Isomura et al., 2006, where it was noted that SWRs are frequently preceded by DOWN states, which are in turn also known to modulate hippocampal activity (see also Hahn et al., 2007 and 2012). 12) The authors should include a Statistical Analysis section in the Materials and methods part with details of the tests used. The authors should also provide exact p-values, statistics, and associated degrees of freedom for all results, including non-significant results (i.e., not just p > 0.5). 13) In Video 1, why was the background so much higher during RUN and were comparisons of calcium activity across states affected by these differences? 14) The experiment with CNO activation of MS cholinergic cells and then mAChR inhibition (Supplementary Figure 4) is very important to show that calcium activity increases with cholinergic activation is really mediated through mAChR. It should be in the main figures to support a major finding of the paper, namely the role of mAChR in Ca2+ activity. 15) Why do some results refer to 5 mice and others refer to 6? 1) How were exploratory behaviors, slow wave sleep, and REM sleep identified and defined? The authors report that these states were associated with different theta/δ ratios, but theta/δ ratios are typically used to differentiate REM sleep from slow wave sleep. 2) The authors should provide exact p-values, statistics, and associated degrees of freedom for all results, including non-significant results (i.e., not just p > 0.5). 3) The details about electrophysiological recordings are unclear. The authors state that they used a 16-contact linear probe in some animals, or 8 independently drivable stereotrodes in other animals. It is unclear how many mice had each kind of recording. Also, which channels were used for analyses? Also, were the methods for detecting sharp wave-ripples and theta the same for the different types of recordings? 4) Related to the above point, was multiunit activity recorded from all depths of the probes or just from stratum pyramidale? This is important regarding whether some of the multiunit recordings likely included interneurons or more likely picked up pyramidal cells. 5) Also related to the above point, the authors also state that a skull screw was used to obtain EEG recordings in animals with cannula. How were the authors certain that sharp wave-ripples and theta could be detected from a skull screw? The authors need to provide example recordings to demonstrate that these patterns could be detected. 6) Why do some results refer to 5 mice and others refer to 6? 7) In Video 1, why was the background so much higher during RUN and how did this affect comparisons of calcium activity across states? a) Figure 1: The theta/δ ratio in the figure does not show a significant increase in the run versus rest behavioral state. This is important for the paper and the authors should explain this apparently anomalous result. Moreover, the authors state in the Results section that "As expected, both exploratory behavior and REM sleep were associated with a high theta/δ ratio, which diminished in quiet wakefulness and slow wave sleep (repeated measures ANOVA: F (3, 12) =3.965, p>0.05; Figure 1I)"; However, their results do not seem to support this statement. They should show group-averaged or individual power spectrum analysis of the theta power changes with behavior states, instead of, or along with, the theta/δ ratios. b) Activation of either cholinergic cells in MS or their axonal inputs to hippocampus, leads to increased rates of Ca2+ event during quite wakefulness. However, even though both i.p and i.h injections of CNO to activate either the cholinergic cells in MS or cholinergic inputs to hippocampus, respectively, were done during quite wakefulness (rest) state, the running velocities in Figure 3L and Figure 3T are very different. Why is this? c) Similarly, mAChR inhibition carried out by either i.p or i.h during exploratory behavior (run) state in Figure 4, both result in decreases in the rate of Ca2+ events. However, the results of the measured running velocities shown in Figure 4H and 4P are significantly different. d) Since the central point of this manuscript is a link between behavioral states and Ca2+ dynamics, it would be crucial to provide evidence of the behavioral state in which each of the manipulations were carried out to evoke changes in Ca2+ dynamics. Thus, it would be useful to have pre-injection and post-injection comparisons. e) Similarly, the corresponding increase or decrease of theta power upon activation or inhibition of the cholinergic system would be useful to correlate with the various manipulations and Ca2+ dynamic changes. f) The experiment with CNO activation of MS cholinergic cells and then mAChR inhibition (Supplementary Figure 4) is very important to show that the Ca2+ event increase with cholinergic activation is really mediated through mAChR. It should be in the main figures to support the major finding of the paper: the role of mAChR in Ca2+ dynamic activity. Additional controls with only CNO injected (in absence of DREADDs) are also needed to determine whether the changes in Ca2+ are actually due to changes in mAChR function and not to CNO itself. g) Please include a Statistical Analysis section in the Materials and methods part with details of the tests used. In summary: the premise of the studies presented is important and interesting. However, the authors need to address the issues listed above before their paper is ready for publication. In this work, Zhou and colleagues perform recordings that feature an impressive combination of calcium imaging, lfp and multi-unit extracellular recordings, chemogenetics, and pharmacology. They make a series of interesting observations: that calcium transients are suppressed prior to the onset of hippocampal sharp-wave ripples (SWRs), that injections of CNO activation in mice with septal Chat-hM3DQq receptors increases calcium transients, and that scopolamine injections blocked calcium transients. These observations are used to argue that muscarinic acetylcholine receptors play a critical role in hippocampal calcium activity. If convincingly presented, these are important findings as they point towards dissociations between calcium and extracellular activities and a specific role for mAchRs. However, I had concerns with the approach for each of the findings and at present I am not convinced that confounds cannot account for the various observations. The silence in calcium transients prior to SWRs is interesting, but seems to follow from prior observations by Sirota et al., 2003 and Isomura et al., 2006, where it was noted that SWRs are frequently preceded by DOWN states, which are in turn also known to modulate hippocampal activity (see also Hahn et al., 2007 and 2012). The possibility that transients are suppressed during SWRs themselves could be very interesting, but there was insufficient accuracy and confidence in the temporal resolution to draw any conclusions here. It is difficult to determine the exact onset of a calcium transient at the timescales necessary for any firm conclusions. Furthermore, one cannot be certain that there isn't a systematic lag between electrophysiological and calcium events in the recordings. So from what I can tell, it remains possible that neuronal firing during SWRs produces calcium transients that are observed slightly after the lfp-detected ripple. The CNO hM3Dq results are interesting, but an important control is missing from these experiments. The authors did not examine the effects of CNO alone, without the hM3Dq receptor expression (Gomez et al. Nature 2017) – CNO can also bind to other endogenous receptors. Effect of CNO with hM4DI could have provided a compelling contrast, but these were not performed. In these and elsewhere it would be important that the MUA activity is shown alongside the Ca transients throughout the figures in the paper. Thank you for resubmitting your work entitled "Cholinergic modulation of hippocampal calcium activity across the sleep-wake cycle" for further consideration at eLife. Your revised article has been favorably evaluated by Michael Frank as the Senior Editor, and three reviewers, one of whom is a member of our Board of Reviewing Editors. The revision by Zhou et al. is certainly an improvement, but I have remaining concerns. Analyses in Figure 2 are based on different windows, "PRE" "SWR" and "POST", but it is not clear what time periods these correspond to and whether those periods are appropriate for the different measures. The legends indicate that PRE is 2-5 s before the SWR and POST is 1-2 s after the SWR. Perhaps -2 to +1 s around the SWR are considered the SWR period, but I could not be sure. In any case, it's not clear whether these periods are appropriate for the different analyses because the Ca rate and the Neuropil z-score have different dynamics. Ca rate drops in the ~1s before the SWR, while Neuropil peaks in the ~1s after the SWR. Using the same "SWR" windows for both analyses may obscure significant changes, potentially why the increase in Neuropil does not reach significance. The relevant time periods should be easily identified from the figure and its legends. I am still confused by what the "Neuropil" z-score is really measuring. I had recommended a discussion of this measure, which the authors did not address. The only thing I can find about this is from the Materials and methods that "from this ROI the 50% of pixels with below-average variance in fluorescence were used." It's not clear to me what exactly this is measuring. As defined, some of these pixels may in fact overlap with parts of somata. Is that appropriate? Is the neuropil also corrected for motion? I believe the authors should discuss and provide a rationale for what they believe this measure provides. The ROI and some sample "neuropil" pixels should be shown. Importantly, do the remaining 50% of pixels behave consistently with the neuropil pixels? It would also be helpful to illustrate the non-thresholded Ca activity for the somata used for event detection, as it remains possible that calcium events amplitudes are lower during SWRs and therefore that the transients are generally being missed. This possibility should be considered in the Discussion section as cells typically show only a few action potentials during SWRs, perhaps not enough to produce a sufficiently large Ca transient. I had also indicated previously, but that authors did not regard the Niethard et al., 2016 study. I still think it's important for the authors to cite and discuss this paper, in which they recorded Ca activity in the cortex of mice across awake and sleep states. Unlike the current study, they found the least Ca activity during REM, except in PV cells, with intermediate levels during SWS. Therefore, state-dependent and cholinergic effects may not be uniform across brain regions. To address the concern of a systematic delay between electrophysiological measurements and calcium measurements, we first accounted for the delay between calcium transient detection, defined as the time at which the event reached 20% of its maximum amplitude, and the start of calcium transients on average (0.114 ± 0.001 s; n=7 mice). Accounting for this delay, the maximal reduction in calcium activity preceded SWR onset by 0.189 ± 0.118 sec. Consistent with the capacity for calcium imaging to detect the SWR-associated synaptic barrage with temporal fidelity, as noted previously, SWRs were associated with a time-locked (mean ± s.e. : -0.04 ± 0.10 sec) change in the extra-somatic calcium fluorescence of the neuropil, with a nonsignificant increase followed by a significant, delayed reduction (repeated measures ANOVA: F (2, 12) =15.627, p=0.003, n=7 animals; post-hoc comparisons: Pre vs. SWR, p=0.130; Pre vs. Post, p<0.001; SWR vs. Post, p=0.003; Figure 2G and K, left). To evaluate for CNO off-target effects, CNO was first injected i.p. in animals lacking hM3Dq receptor expression. No effect was observed on the rate of dynamic Calcium activity (Calcium event rates, p=0.496; amplitudes, p=0.710; paired t-test, n=5; Figure 3W and Figure 3—figure supplement 4). In addition, intra-hippocampal injection of CNO in animals lacking hM3Dq receptor expression did not alter on the rate of dynamic calcium activity (calcium event rates, p=0.637; amplitudes, p=0.128; paired t-test, n=4; Figure 3W and Figure 3—figure supplement 4). The SWR-triggered reduction in dynamic calcium activity started and was often greatest before the SWR began (minimum, mean ± s.e. : -0.075 ± 0.118 sec). To refine the temporal relationship between calcium activity and SWRs, as noted above, we first accounted for the delay between calcium transient detection, defined as the time at which the event reached 20% of its maximum amplitude, and the start of calcium transients on average (0.114 ± 0.001 s; n=7 mice). Accounting for this delay, the maximal reduction in calcium activity preceded SWR onset by 0.189 ± 0.118 sec. Consistent with the capacity for calcium imaging to detect the SWR-associated synaptic barrage with temporal fidelity, SWRs were associated with a time-locked (mean ± s.e. : -0.04 ± 0.10 sec) change in the extra-somatic calcium fluorescence of the neuropil, with a nonsignificant increase followed by a significant, delayed reduction (repeated measures ANOVA: F (2, 12) =15.627, p=0.003, n=7 animals; post-hoc comparisons: Pre vs. SWR, p=0.130; Pre vs. Post, p<0.001; SWR vs. Post, p=0.003; Figure 2G and K, left). To independently assess the temporal alignment of the LFP and the calcium fluorescence data, we placed a stimulating electrode in contralateral CA3 to activate the commissural pathway and evoke both a field EPSP and an associated change in GCaMP6f fluorescence in CA1 neurons. Stimulation evoked a field EPSP with mean latency 20.8 ± 0.7 ms and an associated increase in somatic calcium fluorescence that started within 66.7 ± 16.7 ms (1.3 ± 0.3 samples) and peaked within 100 ± 0 ms (2 ± 0 samples; n = 3 animals; Figure 2—figure supplement 2). Accounting for this offset and the ~190 ms offset delineated above further advances the timing of dynamic calcium activity relative to SWR onset. Together, these results support the observation that dynamic calcium activity transiently falls in the immediate pre-SWR period. (subsection “Coordination of hippocampal dynamic calcium activity across behavior”, third paragraph). 3) How exactly were exploratory behaviors, slow wave sleep, and REM sleep identified and defined? The authors report that these states were associated with different theta/δ ratios, but theta/δ ratios are typically used to differentiate REM sleep from slow wave sleep, thus making this "result" a consequence of the method. We have clarified these definitions of behavioral state in the manuscript (Materials and methods, subsection “Calcium imaging and electrophysiology recording”). Exploratory behavior was defined as running behavior (>3 cm/sec) on the linear track. Quiet wakefulness, slow wave sleep, and REM sleep were scored in the sleepbox. Quiet wakefulness was classified during periods of wakeful immobility (< 0.5 cm/sec), both prior to sleep and following arousal events and postural changes. Slow wave sleep was classified by irregular activity and SWRs arising in the setting of prolonged immobility (at least 3 minutes) in a sleep posture. REM sleep was classified by high theta power (5-12 Hz) in the LFP arising out of slow wave sleep in association with persistent immobility, with each epoch of REM lasting at least 10 seconds. Where available (3/5 animals), EMG confirmed classification. We have modified Figure 1L to contrast theta across behavioral states excluding REM sleep. Also, the theta/δ ratio in Figure 1 does not show a significant increase in the run versus rest behavioral state. This is important for the paper, and the authors should explain this apparently anomalous result. We have modified Figure 1L (subsection “Coordination of hippocampal dynamic calcium activity across behavior”, first paragraph) to contrast theta across behavioral states, excluding REM sleep. As expected, there was a significant main effect of behavioral state on theta power (repeated measures ANOVA excluding REM: F (2,8) =20.468, p=0.001), with higher theta power in exploratory behavior than quiet wakefulness and SWS (post hoc comparisons with run: quiet wakefulness, p=0.003; slow wave sleep, p=0.015; Figure 1L). Moreover, the authors state in the Results section that "As expected, both exploratory behavior and REM sleep were associated with a high theta/δ ratio, which diminished in quiet wakefulness and slow wave sleep (repeated measures ANOVA: F (3, 12) =3.965, p>0.05; Figure 1I)"; However, their statistical results do not seem to support this statement. The authors should show group-averaged or individual power spectrum analysis of theta power changes with behavior states along with theta/δ ratios and clarify these puzzling results. Figure 1L shows group-averaged theta power as a function of behavioral state. 4) Activation of either cholinergic cells in MS or their axonal inputs to hippocampus, reportedly leads to increased rates of calcium events during quiet wakefulness. However, even though both i.p and i.h injections of CNO to activate either the cholinergic cells in MS or cholinergic inputs to hippocampus, respectively, were reportedly done during quiet wakefulness, the running velocities in Figure 3L and Figure 3T are very different. Why is this? We now report velocities in quiet wakefulness (Figure 3M, V) for direct comparison of i.p. and i.h. CNO injections. Also, running speeds greater than 5 cm/s, as shown in Figure 3L, are not typically considered quiet wakefulness. As noted above, we now report velocities in quiet wakefulness (Figure 3M, V) for direct comparison of i.p. and i.h. CNO injections. Similarly, mAChR inhibition carried out by either i.p or i.h injection in Figure 4 both resulted in decreases in the rate of calcium events. However, the measured running velocities shown in Figure 4H and 4P are significantly different. In which behavioral states were these manipulations carried out? As noted above, systemic injection of scopolamine was studied during run behavior, where we would anticipate the greatest effect of scopolamine on calcium activity. Figure 4J, K reflect this. Intrahippocampal injection of scopolamine was studied in quiet wakefulness (Figure 4S), because the implantation of the intracranial cannula reduced stability of calcium imaging during running. Figure 4—figure supplement 2 shows the impact on scopolamine i.p. on velocity in the sleep box. We have modified the manuscript to clarify that animals were awake during all manipulations, to report time spent moving in the sleepbox, and in an independent set of mice, we have reported the effect of CNO and scopolamine injections on detailed behavior (Figure 3—figure supplement 2, Figure 4—figure supplement 1). We now report that neither CNO-associated changes in SWR rates (p=0.4, Spearman) nor changes in theta power (p=0.7, Spearman) significantly correlated with CNO-associated changes in calcium event rates. In addition, we report that neither scopolamine-associated changes in SWR rates (p=0.3, Spearman) nor changes in theta power (p=0.14, Spearman) significantly correlated with changes in calcium event rates. (subsection “Role for acetylcholine in hippocampal neuron dynamic calcium activity”). We have clarified these details in the Materials and methods (probes are detailed in the subsection “Preparation for endoscopic calcium imaging and electrophysiology”; channels and methods for theta and SWR detection in the subsection “Data analysis”). We have clarified that skull screws were implanted for EEG in cannula-implanted mice for purposes unrelated to the present study (subsection “Chemogenetics, cannula implantation and intracranial injection”). We state that multiunit activity was selectively analyzed from sites estimated to be in the pyramidal cell layer (subsection “Data analysis”). We now show MUA in each figure. We agree and as noted above have pursued additional experiments and analyses which confirm that calcium transient reduction precedes SWR onset, consistent with the possibility that this reduction may reflect modulation of hippocampal activity by this neocortical DOWN state. We used identical display settings across the videos to highlight the significant differences in calcium activity across behavioral states. The higher background observed during run behavior is likely to reflect a combination of extra-somatic calcium activity in the neuropil and out of plane somatic calcium activity. The PCA/ICA approach used is resilient to this issue, and we focused on changes in calcium fluorescence. As a result, comparisons of somatic calcium activity across states are insensitive to differences in background. We have incorporated these data into Figure 3 (Figure 3X, Y). We have clarified this in the Materials and methods (subsection “Preparation for endoscopic calcium imaging and electrophysiology”). Analyses in Figure 2 are based on different windows, "PRE" "SWR" and "POST", but it is not clear what time periods these correspond to and whether those periods are appropriate for the different measures. The legends indicate that PRE is 2-5 s before the SWR and POST is 1-2 s after the SWR. Perhaps -2 to +1 s around the SWR are considered the SWR period, but I could not be sure. Thank you for this point. We apologize for any confusion. As stated in the Materials and methods, “Baseline Ca2+ activity was taken from -5 to -2 seconds prior to the start of SWR events. Across all SWRs, SWR-associated Ca2+ activity was measured at SWR onset. Delayed Ca2+ activity was measured 1-2 seconds after the SWR.” These points were also noted in the legend for Figure 2. Thus, Ca2+ activity was measured instantaneously at the time of SWR onset. We have clarified this further in the figure and legend. In any case, it's not clear whether these periods are appropriate for the different analyses because the Ca rate and the Neuropil z-score have different dynamics. Ca rate drops in the ~1s before the SWR, while Neuropil peaks in the ~1s after the SWR. Using the same "SWR" windows for both analyses may obscure significant changes, potentially why the increase in Neuropil does not reach significance. The relevant time periods should be easily identified from the figure and its legends. We agree that Ca2+ dynamics in the somas and the neuropil are distinct. However, as inspection of Figure 2 shows, and as discussed in the Results, the minimum of somatic Ca2+ rate and the maximum of neuropil Ca2+ activity both occur at approximately the time of SWR onset (0 s). As requested, we have added the time periods to the figure to complement this information in the legend. I am still confused by what the "Neuropil" z-score is really measuring. I had recommended a discussion of this measure, which the authors did not address. The only thing I can find about this is from the Materials and methods that "from this ROI the 50% of pixels with below-average variance in fluorescence were used." It's not clear to me what exactly this is measuring. Thank you for this helpful comment. To define the set of neuropil pixels, we first took the maximum intensity of each pixel across the set of normalized ICs to generate a distribution. The set of neuropil pixels was then defined as those pixels lying below the median of this distribution. The neuropil trace was taken as the integral of the ΔF/F time series over the set of neuropil pixels. We have clarified this in the Materials and methods (subsection “Data analysis”). As defined, some of these pixels may in fact overlap with parts of somata. Is that appropriate? Is the neuropil also corrected for motion? In practice, ICs that had low spatial variance and ICs that were not spatially compact were discarded. As a result, the neuropil measure as defined above effectively excludes the pixels that meaningfully contribute to somas. Please note that the entire video undergoes motion correction as an early pre-processing step, as noted in the subsection “Data analysis”, including all pixels contributing to the neuropil measure and to somas. I believe the authors should discuss and provide a rationale for what they believe this measure provides. The ROI and some sample "neuropil" pixels should be shown. We have increased discussion and rationale for the use of this measure (Results subsection “Coordination of hippocampal dynamic calcium activity across behavior”, third paragraph) and have provided a figure (Figure 2—figure supplement 2). Because GCaMP6f expression is present in both somas and dendrites (e.g., Chen et al., 2013), we anticipated that an aggregate of extrasomatic pixels would enrich for dendritic calcium dynamics capable of reflecting SWR-associated synaptic activity with temporal fidelity. Importantly, do the remaining 50% of pixels behave consistently with the neuropil pixels? Based on the definition of the neuropil measure, the remaining 50% of pixels will include pixels contributing to identified somas, pixels contributing to unidentified somas, and pixels contributing to extrasomatic processes. As this is a complex measure of uncertain biological meaning, we have not studied it. It would also be helpful to illustrate the non-thresholded Ca activity for the somata used for event detection, as it remains possible that calcium events amplitudes are lower during SWRs and therefore that the transients are generally being missed. This possibility should be considered in the Discussion section as cells typically show only a few action potentials during SWRs, perhaps not enough to produce a sufficiently large Ca transient. Figure 2A illustrates the non-thresholded Ca activity used for event detection. We provide an additional plot below. We previously noted in the Discussion that “although instantaneous firing rates during theta and SWR events are comparable, differences in spike counts and in patterned activity between these hippocampal oscillations may also contribute”, and that “the possibility remains that non-theta states are associated with somatic Ca2+ event amplitudes below the resolution of the in vivo microendoscopy technique used here“. We now have expanded this Discussion as requested (fifth paragraph). This work was supported by R01 AG054551 and Fidelity Biosciences awards. Animal experimentation: This study was performed in strict accordance with the recommendations in the Guide for the Care and Use of Laboratory Animals of the National Institutes of Health. All of the animals were handled according to an approved institutional animal care and use committee (IACUC) protocol (2012N000206) of the Massachusetts General Hospital. All surgery was performed under isoflurane anesthesia, and every effort was made to minimize suffering. © 2019, Zhou et al. A combination of old and new techniques has revealed new details about the behavior of individual neurons across the sleep-wake-cycle.